As readers of this blog will already be aware, Arbworx has worked on some really high-end projects over the past year. 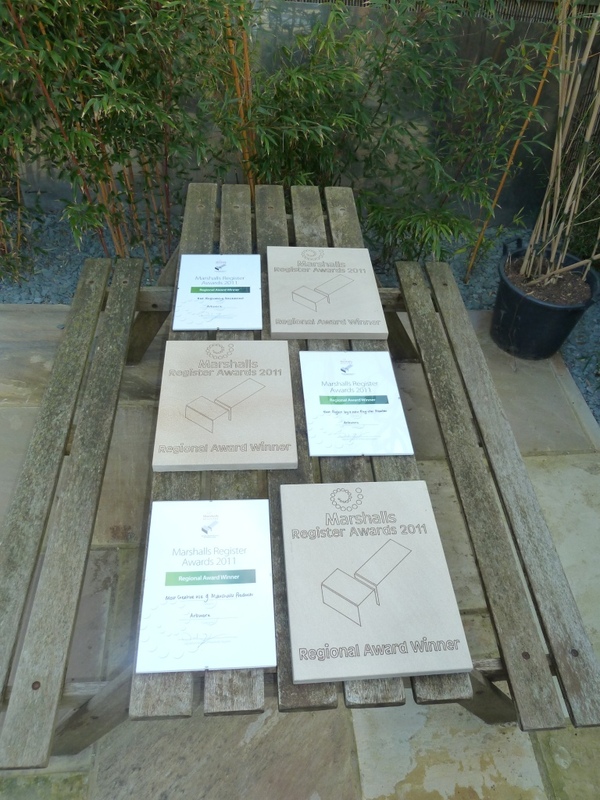 Some of our favourites have formed the subject of previous blogs but it was at Thursday night’s Marshalls Awards ceremony that all our hard work finally paid off with the Arbworx team scooping not one, but three awards. The occasion was the final night of the Marshalls Spring Road show; an opportunity for the sales management to meet the landscaping firms who have achieved or maintained their coveted status as Marshalls Registered Installers. Arbworx joined their ranks back in July after completing a thorough assessment process, and the team were encouraged to enter one of their largest projects for the Marshall Regional Awards. Choosing which project to enter was a tough decision, given the high standards to which all our works are completed, but in the end we selected the Quadrant Landscape Garden Makeover in Shoreham-by-Sea as it most closely fitted the criteria laid down by the Marshalls judging panel. We had used several Marshalls landscaping products during the build and felt that the scale of the transformation Arbworx had achieved was testament to our expert landscaping skills. We were not wrong! The evening was a well-planned event by the Marshalls team and included several seminars on new services aimed at Marshalls’ trade customers as well as updates on improved customer service and sales techniques designed to support landscaping firms in an increasingly competitive marketplace. The first few awards for ‘best project to a certain value’ were won by long-standing Marshalls installers. Then came the award for Best Newcomer. The Arbworx team held its collective breath, and… Yes! A win for Arbworx! And this was not the only one either. We went on to win a second award for ‘Most creative use of Marshalls products’ and then a third – the only team to do so – and this time for ‘Best engineering achievement’. Proud, happy, ecstatic? I think all three descriptions fitted that night. Recognition by your peers on such a scale is immensely gratifying and a well-deserved reward for the team’s maintaining such a high standard of expertise throughout such tough economic conditions. In the meantime we have several more exciting projects in the pipeline as we move towards the Spring. We’d also like to remind our customers, new and existing, that however cold it is outside at the moment, the summer will be upon us sooner than we think. If you’re considering having work done in your garden do please give us a call sooner rather than later and we’ll ensure everything is completed in time for you to really enjoy the summer in style.